We have been pushing it since Presidio and were starting to feel the strain, particularly in the mornings. Luckily we were in the most beautiful place, with our favorite people. Yee haw gang. Time for another day in this remote and challenging place! We’re up against a very ferocious invasive species, RIVER CANE. Many people had told us the cane would be the major obstacle to hiking along the river and today we understood their warnings. The bamboo-like grass has a thick, woody stalk with a tuft on top that reaches up to 26 ft tall. It grows in thickets that are so solid it’s like pushing through a wall. Today the cane reliably lined both sides of the river up to 15-20 ft inward. Is there any rhyme or reason to this stuff? We learned to look for potential openings and then push through and stay behind the wall until we absolutely had to rejoin the river. Unfortunately, this meant we lost sight of the boaters for big chunks of time, which was nerve-racking for both parties. In order to communicate we devised a system of calls we shouted periodically throughout the day. “Woooo-oo” was our basic check in to communicate where we were in relation to the boaters and to indicate that everything was a-okay. Sometimes the boaters were further downstream, sometimes the hikers, but it was a relief to hear one way or the other. In case of emergency we made a shrill “ay-yi-yi” or if we wanted the other to stop we yelled a simple “hey!” It took some time to work the kinks out. The morning passed quickly, with an open expanse of land behind the cane wall that the hikers moved through easily. Like yesterday, a network of cattle trails crisscrossed the land, providing some direction forward. Lost in conversation, we were shocked to turn the corner and discover a handful of abandoned houses with a road leading up to them. We had been lulled into such a sense of security and remoteness that is was jarring to be reminded that people are (or were) still out here. Since we were on the Mexican side, we were extra nervous about inadvertently stumbling into trouble. We quickly backtracked, moving back into the security of the trees. The river channel took a more sinuous path today allowing the hikers to cut off a meander while the boaters went all the way out and around. It was surprisingly disorienting to be out of sight of the river. Yesterday the canyon walls and river created an obvious channel to move through but today it was almost impossible to predict the twists and bends of the river from behind the cane. 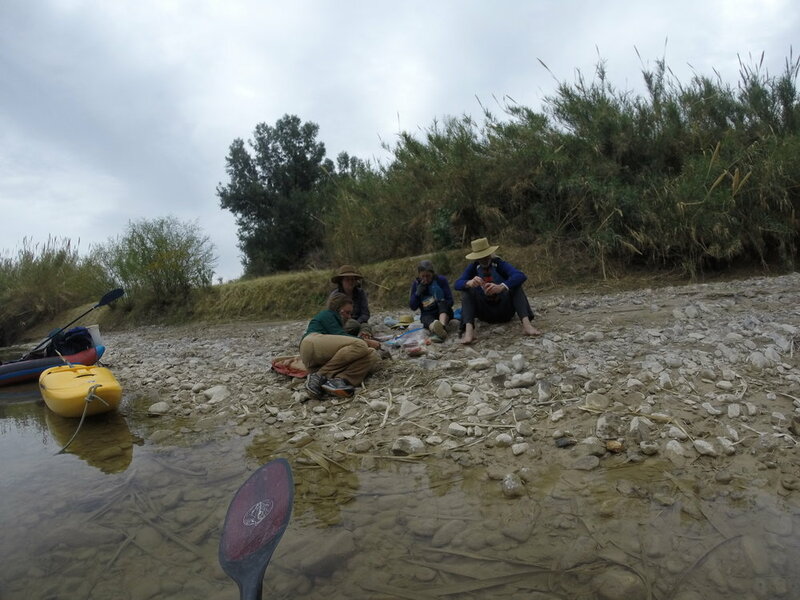 The river and surrounding desert terrain were two different worlds. We tried to stay close to the thick green vegetation that indicated water, but it was all too easy to be led astray by other patches of green snaking down some side drain. The hikers lost track of each other at one point causing yells to be sent up from all directions, the boaters over there, hiker one here, hiker two behind there. Silly and embarrassing. Heath Canyon across from La Linda, Mexico is the take-out for most boaters who float Boquillas Canyon. A white cathedral on elevated terrain was the main landmark for the little town of La Linda. Only a few homes looked inhabited, the rest of the abandoned buildings must have belonged to the old resort and condos that existed at one point. We had heard that this used to be a desirable area for fluorite mining, which was cool because just yesterday we ran into a vein of clear, crystal-like rock with long cleavages. Nikki had been able to recognize it as fluorite thanks to her recent work classifying rocks at her job at the museum. Gerstacker Bridge used to connect La Linda in Mexico to a road in the US until the bridge was closed in 1997. All that was left when we walked past was a structure of crumbling concrete blocked on the US side with substantial barriers. Weeks later we talked to a local who used to play for a baseball team in La Linda some years ago. It must have been a happening place. We were left to our imaginations about what the town had looked like when it was thriving. By mid-afternoon the hiking had taken a nosedive for the worse, with thickening cane mixed with impenetrable thorny mesquite. We tried moving further from the river in the hopes of finding more open terrain but were greeted with more and more frustrating thorns. It was a trade-off between the thick vegetation by the river versus the vicious cacti of the desert! It was hard not to panic when the boater yells got further and further away while we fought our way forward. Do we keep pushing forward or cut our losses and move back towards the familiar? 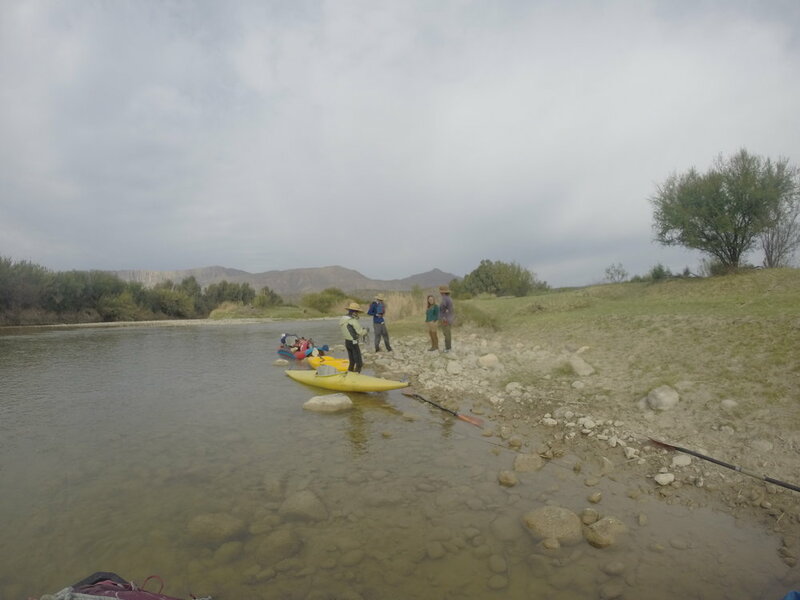 The longer we waited to make the decision, the further downstream the boaters floated. In a gathering frenzy of claustrophobia and frustration, we decided to smash through the cane and return to the river. It is impossible to capture how absolutely vicious and abusive the cane thickets feel. You can only crash forward, like an animal caught in barbed wire, floundering and desperate to be out as sweat froths and every sticky, thorny thing catches on your clothes and pulls you back and away from the faint light ahead. It’s exhausting, and your energy fades in direct proportion to your frantic need to be out. Guys, we are not being drama queens here, this is SO HARD. We popped out in a haze of half-laughter, half-tears and slithered down into the water, submerging almost to our waists. Our rescuers had paddled upstream and were waiting patiently to fish us back out. We had officially entered the “Lower Canyons”, and the narrowing walls of Heath Canyon had led us like cattle to slaughter straight into the deep groove of thorny vegetation. We attempted to get out and hike a couple more times but the rising walls kept cliffing us out. It’s always an embarrassing thing to have the boaters watching from below, calling out advice, as the hikers panic and backtrack and clumsily navigate. At least it has a happy ending when you can scramble down, hop off a little cliff, and land in a boat with total gratitude. Thanks boaters, now let's sail the short distance into camp! Best campsite yet! Tonight we got Nikki to read aloud from our guidebook. It has been difficult to keep up with what is around us, given how demanding the paddling and hiking have been so it’s nice to go over it all again at night. We took turns ragging on our guidebook, which makes liberal use of the word “interesting” to explain every notable feature. The canyon is interesting. There is an interesting spring. Take a moment to notice the interesting rocks. The author also mentioned Robert Hill, an explorer who claims to have done the first recorded passage down the Lower Canyons "though he was accompanied by two guides who had floated the canyons previously". HAH! Blissful unconsciousness was delayed for way too long thanks to the deafening albeit hilarious noises of a nearby donkey. Go to bed little donkey.